Happy fall, y’all! While I am never in a rush to say goodbye to summer, I always welcome autumn with open arms. I am craving cider and stew and squash. I made pumpkin alfredo last week with turkey (I’m still working on that recipe though). But I’m even more excited to share with you the Halloween wreath I made this weekend. The hardest thing about making this wreath was trying to find the right spider. I envisioned it with a glow in the dark spider, but could not find one anywhere, so I settled for a glittery orange spider (from Michael’s). The “shimmery” black tulle was on sale at Jo-ann’s, where I also grabbed the orange sheer ribbon. The wreath form is from the Dollar Tree. I rented Taken when I needed a break from cleaning house and knocked out this wreath before it was over. I had two yards of tulle, which I cut lengthwise into quarters and then into 2-3 inch strips. All my cutting was approximate because it is spider webs and Halloween, so variance is a good thing (which so makes this my kind of project!) 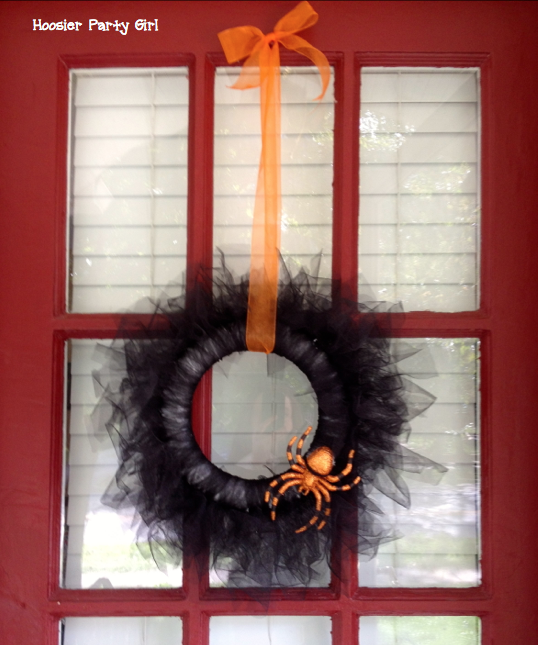 I simply tied the strips of tulle around the wreath form, double knotting them, and I used one of the strips to secure the spider as well. The tulle shimmers nicely in the autumn sunshine too.